I've seen these smocks being sold by many dealers over the years along with the incorrect Splinter A models. My question is, does anyone know if these ever existed and if so, to what extent they were issued? I've never seen an original picture depicting this camo being worn in by Field Division troops or seen any documents detailing its issue. I believe that this item was like the Feldbrau M43, which if it existed, was only in small numbers and the Feldbrau M44 which I think only existed on paper. So my question is, is this a fantasy/rare item? It is strange that period photographs of a tan & water pattern FD camo jackets never seem to pop up. Kind of like sumpftarn helmet covers (yet another story). We know the camo jackets existed. I've personally owned a beautiful example years ago. WAF's thread on Luftwaffe Field Divisions (in the Fallschirmjager section) has plenty of photos of them. One would think that when tan & water jump smocks came out these would have been issued as well. The search for evidence continues! Yeah I used to own a repro tan and water FD smock many years ago when I first started the impression, which I later sold and upgraded to a Splinter B one. I have a theory about these smocks, which could just be that. Does anyone know when the Tan and Water jumpsmock appeared? My theory is that when it did, the FD divisions were already moved to the Army, therefore not receiving any of these smocks because they were no longer in the Luftwaffe and were now considered to be a regular army unit and therefore not meriting being issued with special camouflage material. Therefore if the smock existed, it would be issued to Luftwaffe personnel and my theory is, give to new recruits to FJ ground units in the latter years of the war instead of a jumpsmock. Only evidence I've seen of this smocks' existence was a photo of an example which was claiming to be an original about four, maybe five years ago. As I'm not on the WAF (must create an account sometime), I'm unaware really of their research. I'll see if I can find this picture of the said original and if so I'll post it up here. Haven't found anything as to the issue of the Sumphtarn jacket but there are certainly pictures of ones in people's collections. There are plenty of originals, but I don't think they were ever issued in any scale. Most you find are completely mint. I have seen ONE photograph of one in use over the years, and that was on a very high ranking officer. That's the ONLY photo I have ever seen of one in use. Splinter all the way. Feldblau M44's did exist and were issued. Feldblau M43's, another story, not much evidence but something for a different topic. Interested Imme, was unaware the M44 in Feldblau existed but as you say something for another thread. Out of interest, do you have the photo of the tan and water smock or the link to where it might be? I've never seen it and am keen to see it. Check out WAF below. It shows the photo I believe you are speaking of. I owned an original Luftwaffe M43 that was feldgrau. It was made in Antwerp with a dark blue lining, Luft breast eagle, Luft Flak shoulder boards & Luft Obergefreiter insignia on the sleeve. The gull rank wings were pinned directly through the collar. I should have never sold that tunic! It seems anything was possible back then. As mentioned by 352nd, to determine when Sumpftarn FD jackets were officially issued would determine if Field Divison troops actually got them or if they were indeed only issued to FJ and Flak units still under Luftwaffe control. To me, the ONLY photograph known of a sumpftarn FD jacket in wear. Cheers for posting Imme. Do you know who the Ritterkreuz Winner in the photograph is? His name is Walter Paul Liebing. If anyone can look him up we can find out if he was in a FJ or a FD unit. Walter Liebing, Major, Fhr. 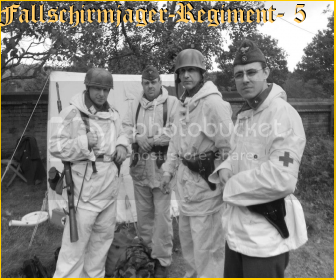 Fallschirmjager Regiment 23. As far as I know, there were no Knights Cross winners in the FD. Okay, so we are back to the only period photo we've found so far of the Sumpftarn FD pattern jacket, is being worn by a FJ Officer. I'm leaning more & more towards the notion that FD sumpftarn pattern jacket was a post Feld Division issue. Until we can determine the actual issue time of the sumpftarn FD jacket ( pre or post November 1943) I would venture to say that it went to Luftwaffe Flak and as supplimental issue to FJ troops. One identified photo can solve this matter. Until then we can only speculate. I'd agree with that Mauser, I'd say these would be a post-43 addition and therefore would only be issued to Luftwaffe troops. As the Field Divisions would now be classified as Army divisions, they'd not be counted and therefore not issued. Part of me wonders if they stopped issuing smocks of any kind after the Heer takeover, as I can't imagine the Army to continue issuing Luftwaffe splinter B smocks (or any other camo garments) to divisions that'd be well down the pecking order for kit. So I'd say any smocks seen past 1943 would be retained ones only not fresh issued.